* Senior club appearances and goals counted for the domestic league only and correct as of 29 October 2016 (UTC). Luke Paul Hoare Shaw (born 12 July 1995) is an English professional footballer who plays as a left-back for Premier League club Manchester United and the England national team. Originally a member of Southampton's youth system, Shaw made his first-team debut for the club in January 2012, and signed his first professional contract in May that year before becoming a regular in the Southampton team over the next two seasons. In 2014, Shaw was signed by Manchester United for £30 million, then a world record transfer fee for a teenager. On 5 March 2014, he made his senior international debut for the England team in a 1–0 friendly win against Denmark, and later that year was selected in the squad for the FIFA World Cup. Shaw was born in Kingston upon Thames, London, and attended Rydens Enterprise School in Hersham, Surrey. He grew up as a Chelsea supporter, and has claimed that he originally wanted to play for the London club. As an eight-year-old Shaw played at Chelsea's development centre in Guildford, but was not offered an academy place. 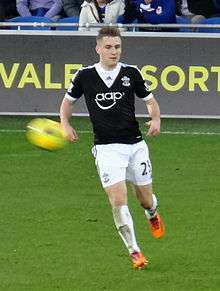 Shaw joined the Southampton Academy at the age of eight, and became a regular in the under-18 team from the age of 15. His first association with the first team came in September 2011, when he was featured as an unused substitute in a League Cup game against Preston North End, assigned the squad number 34. During the January 2012 transfer window, it was reported that Premier League clubs Arsenal, Chelsea, and Manchester City had shown interest in signing 16-year-old Shaw, with the then-Championship club reportedly valuing the defender at £4 million. Southampton quickly responded to such claims though, with then-manager Nigel Adkins assuring the media that "Luke Shaw is a big part of our future plans", and claiming that the club had "no intention … of letting any of [their] young players move on". At the age of 16, Shaw made his debut for the Southampton first team on 28 January 2012 in the FA Cup, replacing winger Jason Puncheon for the final 13 minutes of the third round tie against Millwall, which finished 1–1. Following the club's promotion to the top flight in May 2012, Shaw was one of four youth players offered a professional contract for their return to the Premier League, along with Jack Stephens, Calum Chambers and James Ward-Prowse. The defender made his first start for the Southampton first team in August 2012, playing the full 90 minutes of a 4–1 win over Stevenage in the League Cup, and on 10 November, he became the youngest Southampton player to start a game in the Premier League when he was chosen to play at left-back against Swansea City, completing 74 minutes of the 1–1 draw. Shaw continued to make regular appearances throughout the season, and in manager Nigel Adkins's final game as Southampton manager on 16 January, he set up the second goal in a 2–2 draw away to Chelsea, providing a cross from the left wing for Jason Puncheon to convert in the 75th minute. In an away game against Norwich City in March, Shaw was involved in a collision with striker Grant Holt, which resulted in conceding a penalty in the first minute of injury time at the end of the game, although Artur Boruc saved the ensuing spot kick to ensure the match ended goalless. Shaw finished his first professional season with 28 appearances for Southampton, including 25 in the Premier League. On 12 July, Shaw's 18th birthday, he signed a new five-year deal with Southampton. Shaw scored one goal during Southampton's pre-season preparations, scoring the last in an 8–0 win over Spanish side Palamós on 20 July. In the first game of the 2013–14 season, Shaw was directly involved in the goal that saw Southampton win against West Bromwich Albion when he was fouled in the penalty area by Youssouf Mulumbu in the 89th minute, with Rickie Lambert converting the resulting spot kick to see the Saints edge victory. On 18 April, Shaw was named as one of the six players on the shortlist for the PFA Young Player of the Year award. He was also selected as left back in the PFA Team of the Year 2013–14. On 27 June 2014, Shaw signed a four-year contract (with an option to extend for a further year) with Manchester United for an undisclosed fee thought to be in the region of £30 million, becoming the most expensive teenager in world football. Chelsea were also interested in Shaw, but they backed away from a deal fearing the teenager's excessive pay demands would cause friction in their dressing room. Shaw made his debut in the first match of the club's pre-season tour of the United States, playing the first 45 minutes of a 7–0 win over the LA Galaxy. Before the start of the season, he suffered a hamstring injury that ruled him out for a month. Shaw was named as a substitute for Manchester United for the first time on 14 September in their fourth league match, and was unused as they recorded their first victory of the season against Queens Park Rangers. After again being an unused substitute in the subsequent defeat to Leicester City, Shaw made his competitive debut for United on 27 September, playing the entirety of a 2–1 home victory against West Ham United. Shaw was nominated in late October for the Golden Boy 2014 Award, a prize given to the player considered to be Europe's best young player. On 8 February 2015, Shaw was sent off after receiving a second yellow card during a 1–1 draw with West Ham. On 18 April, Shaw made his return to the starting line-up, replacing the injured Daley Blind. His first match since 9 March ended in a 1–0 defeat to league leaders Chelsea, but Shaw put up a solid performance and was praised by captain Wayne Rooney. Shaw started every league game to begin the 2015–16 season ranging until mid-September. On 15 September 2015, during the opening game of the Champions League group stage against PSV, Shaw was caught by Héctor Moreno with a slide tackle and suffered a double leg fracture. Shaw was given oxygen and treated by nine medical staff during the nine-minute stoppage in Eindhoven before he was taken off on a stretcher, carefully placed on a trolley and taken to hospital. Shaw was expected to be out of action for at least six months. He returned to training on 4 April 2016. Shaw's first experience of international football came in 2011, when he made six appearances for the England under-16 team. He made his debut against Slovenia in February, before competing in the Montaigu Tournament in April and scoring his first international goal against Uruguay at the tournament. He later made his debut for the under-17 team in August against Italy, and played in eight matches in a seven-month stint with the national side. In January 2013, Shaw was set to be called up for the first time to the England under-21 team for the following month's friendly against Sweden, with then-manager Stuart Pearce calling the Southampton defender "an outstanding talent". Unfortunately though, due to an injury picked up in training, he was later forced to pull out of the game. The uncapped defender was subsequently called up for games against Romania on 21 March, Austria on 25 March, and Scotland on 13 August, as well as the UEFA European Under-21 Championship, all of which he had to pull out of for the same reason. He eventually made his England under-21 debut on 5 September when the team faced Moldova in a 2015 UEFA European Under-21 Championship qualification match, and he also played the full 90 minutes of England's second qualification game against Finland on 9 September. On 27 February 2014, Shaw was called up to the England senior side for the first time, for their friendly with Denmark. He made his debut in the game, replacing Ashley Cole at half-time. England won the game 1–0. On 12 May 2014, Shaw was named in Roy Hodgson's 23-man squad for the 2014 FIFA World Cup. He was included at the expense of the experienced Cole, who retired from internationals as a result. Shaw was England's second-choice left-back behind Leighton Baines, and made his tournament debut in the last group game, a 0–0 draw with Costa Rica in Belo Horizonte. Shaw also holds the accolade of being the youngest player to appear at the 2014 tournament. As a left-back with a tendency to play attacking football, Shaw has been compared to former Southampton youth product Gareth Bale, with particular focus being placed on his speed, decision-making and defending skills. Former England international and FA Director of Football Development Trevor Brooking has described Shaw as "technically very gifted." ↑ "Barclays Premier League Squad Lists 2013/14 are revealed". Premier League. 4 September 2013. Retrieved 10 September 2013. 1 2 3 4 5 "Luke Shaw". saintsfc.co.uk. Southampton FC. Retrieved 10 September 2013. ↑ "Luke Shaw - Player profile". The Premier League. Retrieved 22 May 2016. ↑ Murray, Ian (2014-06-23). "Daily Echo". Comment: A harsh lesson for Saints' starlet Luke Shaw. ↑ Mokbel, Sami (25 February 2013). "EXCLUSIVE: Chelsea set to land £10m replacement for Cole – Southampton teen sensation Shaw". Daily Mail. Associated Newspapers. Retrieved 10 September 2013. ↑ "Birthday boy Shaw signs on". Southampton FC. 12 July 2013. Retrieved 10 September 2013. ↑ "Shaw Savouring Chelsea Contest". Southampton FC. 29 March 2013. Retrieved 10 September 2013. ↑ "Chelsea expected to make £20m move for Southampton's Luke Shaw during January transfer window". telegraph.co.uk. 12 December 2013. Retrieved 12 December 2013. ↑ "Southampton 2–1 Preston". BBC Sport (British Broadcasting Corporation). 21 September 2011. Retrieved 10 September 2013. ↑ Wallace, Sam (11 January 2012). "Arsenal face a battle for Saints' £4m teen". The Independent. Independent Print. Retrieved 10 September 2013. ↑ "Luke Shaw will not be sold says Nigel Adkins". BBC Sport (British Broadcasting Corporation). 13 January 2012. Retrieved 10 September 2013. ↑ "Millwall 1–1 Southampton". BBC Sport (British Broadcasting Corporation). 28 January 2012. Retrieved 10 September 2013. ↑ "Southampton promote academy quartet to first team squad". BBC Sport (British Broadcasting Corporation). 23 May 2012. Retrieved 10 September 2013. ↑ Hughes, Dewi (10 November 2012). "Southampton 1–1 Swansea". BBC Sport (British Broadcasting Corporation). Retrieved 10 September 2013. ↑ Bevan, Chris (16 January 2013). "Chelsea 2–2 Southampton". BBC Sport (British Broadcasting Corporation). Retrieved 10 September 2013. ↑ Ornstein, David (9 March 2013). "Norwich 0–0 Southampton". BBC Sport (British Broadcasting Corporation). Retrieved 10 September 2013. ↑ "Luke Shaw: Southampton defender agrees five-year contract". BBC Sport (British Broadcasting Corporation). 12 July 2013. Retrieved 10 September 2013. ↑ "Luke Shaw signs five-year deal with Southampton". premierleague.com. Premier League. 14 July 2013. Retrieved 10 September 2013. ↑ "Palamós 0–8 Saints: Report". Southampton FC. 20 July 2013. Retrieved 10 September 2013. ↑ Johnston, Ben (17 August 2013). "West Brom 0–1 Southampton". BBC Sport (British Broadcasting Corporation). Retrieved 10 September 2013. ↑ "PFA Player of the Year award shortlist: Gerrard and Lallana nominated". The Guardian. 18 April 2014. Retrieved 19 April 2014. ↑ "PFA unveils Team of the Year". BSkyB. 27 April 2014. Retrieved 28 April 2014. ↑ "Manchester United buy Luke Shaw from Southampton for £30m". Sky Sports. 27 June 2014. Retrieved 27 June 2014. ↑ De Menezes, Jack (27 June 2014). "Luke Shaw joins Manchester United: England defender completes £30m move from Southampton". The Independent. Retrieved 27 June 2014. ↑ "José Mourinho: 'Signing Luke Shaw would have killed Chelsea'". theguardian.com. Guardian News and Media. 26 July 2014. Retrieved 14 August 2014. ↑ Stone, Simon (24 July 2014). "Man Utd beat LA Galaxy: Louis van Gaal off to winning start". BBC Sport (British Broadcasting Corporation). Retrieved 24 July 2014. ↑ Taylor, Daniel (13 August 2014). "Manchester United's Luke Shaw out for a month with hamstring injury". The Guardian. Retrieved 13 August 2014. ↑ Orr, James (13 August 2014). "Luke Shaw: Hamstring injury to £30m left-back could accelerate Manchester United moves for Marcos Rojo or Daley Blind". The Independent. Retrieved 13 August 2014. ↑ Henson, Mike (14 September 2014). "Man Utd 4-0 QPR". BBC Sport. Retrieved 27 September 2014. ↑ Sanghera, Mandeep (27 September 2014). "Man Utd 2-1 West Ham". BBC Sport. Retrieved 27 September 2014. ↑ "West Ham United 1–1 Manchester United". BBC Sport. 8 February 2015. Retrieved 10 February 2015. ↑ "Luke Shaw: Joining Man Utd from Southampton has been tough". skysports.com. 20 April 2015. Retrieved 21 April 2015. ↑ "Wayne Rooney believes United could have beaten Chelsea". Official Manchester United Website. 18 April 2015. Retrieved 21 April 2015. ↑ "Luke Shaw: Manchester United man suffers double leg fracture". BBC. 15 September 2015. Retrieved 15 September 2015. ↑ Bernstein, Joe (15 September 2015). "Luke Shaw suffer Horror injury". News. Retrieved 24 September 2015 – via Daily Mail Online. ↑ "Luke Shaw: Man Utd defender returns to training after broken leg". BBC Sport. 4 April 2016. Retrieved 4 April 2016. 1 2 3 "Luke Shaw". TheFA.com. The Football Association. Retrieved 10 September 2013. ↑ Hassan, Nabil (18 January 2013). "Southampton's Luke Shaw set for England Under-21 call – Pearce". BBC Sport (British Broadcasting Corporation). Retrieved 10 September 2013. ↑ "Southampton left-back returns to St Mary's and will miss the meeting with Sweden". TheFA.com. The Football Association. 4 February 2013. Retrieved 10 September 2013. 1 2 "Stuart Pearce names his under-21s squad for games against Romania and Austria". TheFA.com. The Football Association. 14 March 2013. Retrieved 10 September 2013. ↑ "Roy Hodgson names a 25-man squad for game with Scotland at Bramall Lane". TheFA.com. The Football Association. 8 August 2013. Retrieved 10 September 2013. ↑ "Pearce calls up McManaman and Shaw". ESPN FC. ESPN Internet Ventures. 14 May 2013. Retrieved 10 September 2013. ↑ "Pearce confirms changes". TheFA.com. The Football Association. 19 March 2013. Retrieved 10 September 2013. ↑ "Nathan Redmond replaces Tottenham Hotspur winger in squad for Israel". TheFA.com. The Football Association. 24 May 2013. Retrieved 10 September 2013. ↑ "England U21: Luke Shaw and Tom Ince withdraw from squad to face Scotland". Sky Sports. BSkyB. 14 August 2013. Retrieved 10 September 2013. ↑ "Berahino pushes England past Moldova". UEFA.com. Union of European Football Associations. 5 September 2013. Retrieved 10 September 2013. ↑ "Berahino rescues ten-man England in Finland". UEFA.com. Union of European Football Associations. 9 September 2013. Retrieved 10 September 2013. ↑ "England call up Southampton's Luke Shaw for Denmark game". BBC Sport. 27 February 2014. Retrieved 28 February 2014. ↑ "Luke Shaw: Southampton full-back revels in England call-up". BBC Sport. 27 February 2014. Retrieved 28 February 2014. ↑ Winter, Henry (27 February 2014). "World Cup 2014: Southampton left-back Luke Shaw's reaction to his England call brings a breath of fresh air". Daily Telegraph. Retrieved 28 February 2014. ↑ "England 1-0 Denmark" BBC Sport. 5 March 2014. Retrieved 5 March 2014. ↑ "World Cup 2014: England name Ross Barkley in squad". BBC Sport (British Broadcasting Corporation). 12 May 2014. Retrieved 13 May 2014. ↑ "Ashley Cole quits England duty after World Cup omission". BBC Sport (British Broadcasting Corporation). 11 May 2014. Retrieved 24 June 2014. ↑ Taylor, Daniel (24 June 2014). "England end disappointing World Cup with barren draw against Costa Rica". The Guardian. Guardian News and Media. Retrieved 24 June 2014. ↑ "Jose Mourinho: Signing Luke Shaw would have "killed" Chelsea". BBC Sport. 26 July 2014. Retrieved 26 July 2014. ↑ Szczepanik, Nick (31 December 2012). "Shaw shapes up as the 'new Bale'". The Independent. Independent Print. Retrieved 10 September 2013. ↑ Taylor, Louise; Fifield, Dominic (2 July 2012). "Chelsea to offer £4m for Southampton prodigy Luke Shaw". The Guardian. Guardian News and Media. Retrieved 10 September 2013. ↑ "Games played by Luke Shaw in 2011/2012". Soccerbase. Centurycomm. Retrieved 27 June 2014. ↑ "Games played by Luke Shaw in 2012/2013". Soccerbase. Centurycomm. Retrieved 27 June 2014. ↑ "Games played by Luke Shaw in 2013/2014". Soccerbase. Centurycomm. Retrieved 27 June 2014. ↑ "Games played by Luke Shaw in 2014/2015". Soccerbase. Centurycomm. Retrieved 26 December 2015. ↑ "Games played by Luke Shaw in 2015/2016". Soccerbase. Centurycomm. Retrieved 26 December 2015. ↑ "Games played by Luke Shaw in 2016/2017". Soccerbase. Centurycomm. Retrieved 18 September 2016. ↑ "Shaw, Luke". National Football Teams. Retrieved 28 September 2015. ↑ Riach, James (28 April 2014). "Luis Suárez of Liverpool wins PFA player of the year award". The Guardian. Guardian News and Media. Retrieved 22 May 2016. Wikimedia Commons has media related to Luke Shaw.